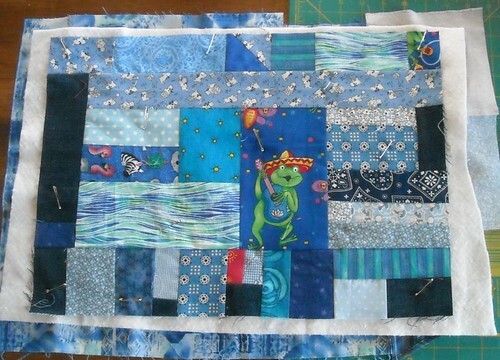 I love it when a quilt is pin basted and ready to quilt. It gets a tiny bit of the quilted feeling, and it's the first time all 3 layers are together as one. I get really excited about getting it done! Here's the back of my DQS8 quilt. Pin basted, ready to quilt. I'm not going to show the front until it's all done. My 9-year-old's blue scrappy placemat. He did the sewing and helped with layout choices. I did most of the pairing up of fabrics for him to sew. He's going to machine quilt it himself. 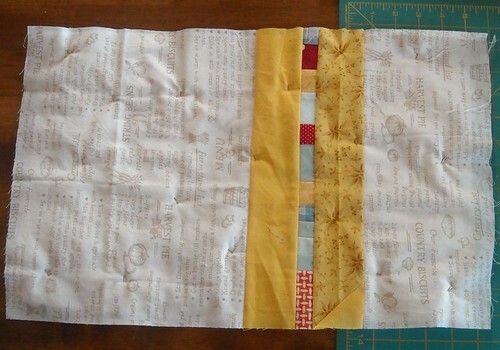 What parts of quilting do you like best? Love the placemat!! I think that right now it is picking out the fabric's and sewing the top together. I am very much a beginner and so the rest can be quite daunting for me;) I of course love it when I am finished! How fun that your son helped make that cute place mat! My favorite part of quilting is probably the binding...BECAUSE I know that it won't be long until my quilt will be done. I LOVE Senior Frog! That placemat is SO cute! What a fun project for kids to learn to sew on. My 7 year-old and I did a few sewing lessons over the summer. Maybe this next summer I'll have her make her own placemat! What a great idea. I love the colorful patchy strip on the back of the first quilt. Can't wait to see the finished product! My favorite part of quilting is the gathering of fabrics. I love the excitement of a new project. And I also love it when a top is finished and ready for quilting! like you seeing it pin basted and waiting to be quilted. it is also bittersweet because the end is so near. this is when I actively find a new project to start immediately after or during the quilting. Ooh! Love the back of your quilt - and how awesome your son is quilting too! You know, that is a tough question...I love when I've got an idea in my head that is compelling me towards the making...and I love when the finished piece matches or exceeds my vision. In between is lots of stress, tedium and worry! As with all sewing projects, picking out fabrics and laying them out is my favorite part!